ABNER SENIRES: More Jesse James Dawson!! Just sending out the word that fellow writer K. A. Stewart just released A Shot in the Dark*, the second book in her series about Jesse James Dawson. 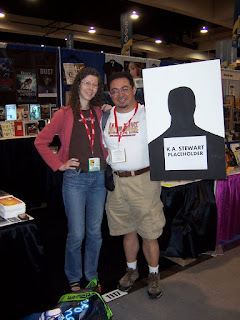 You may remember K. A. from my post about Comic-Con last year in which I was her proxy for the con. Here's a picture of me, K. A., and her editor, Anne Sowards. 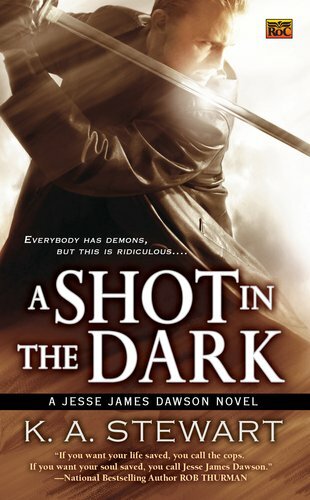 A Shot in the Dark should be available now at fine booksellers everywhere. And if you haven't read A Devil in the Details, the first in the series, go get that one. Better yet, get them both at the same time. Get ye to yon bookshop.